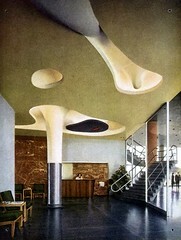 This colorized image of the ceiling designed by sculptor Isamu Noguchi for the entry lobby was the most unusual, striking images from the building. The seamless nature of the design within the architectural space, lighting, structure, sculptural form, and color made this space a significant example of successful the integration of art and architecture. Noguchi created a plaster model for the ceiling based upon Armstrong's architectural plans for the space. The ceiling is functional, providing artificial lighting as well as directing visitors to the hidden elevator lobby to the left of the free-standing column. It is also decorative, providing a counterpoint to the crisp, planar geometries of the building. It appears that the free-standing staircase that wraps around a column on the right. It seems likely that Armstrong designed the stair with it's curved landing in reference to Noguchi's biomorphic forms in the ceiling itself. Countering the concepts promulgated by Mies van der Rohe and many of his colleagues, which called for the strict separation of architecture from the other arts, Noguchi and Armstrong make a convincing argument to the contrary. The above photograph has been 'colorized' for publication in The Architectural Forum magazine. It is based upon the original black and white photograph.